John Wardle originally met John Lydon, John Grey and Sid Vicious at Kingsway College, London, in 1973. 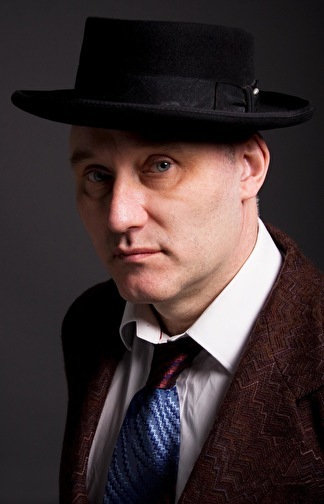 It was Vicious who originally nicknamed John "Jah Wobble" after a drunken binge, and would also loan him his first bass guitar. After discovering his fascination with the bass guitar, Lydon asked Wardle to join Public Image Limited (aka PiL) during the spring of 1978. Wardle's distinctive 'low end' bass immediately put PiL on the map and became the backbone of the band. " The band's debut album Public Image Limited included the band's eponymous first Top 10 hit single. After two magnificent albums, including the mighty Metal Box, Wardle became increasingly disillusioned by the music scene and the politics of the band and their reluctance to play live, and eventually split from the band in mid 1980. In 1986, after a long battle with alcohol, Wardle unexpectedly walked away from the music scene to work for London Transport, but was eventually returned with a revitalized line-up of his 'Invaders of the Heart' band. By the 1990s, Wardle finally achieved public notoriety, including chart success and a Mercury Music Prize nomination for his critically acclaimed 'Rising Above Bedlam' album. However, after releasing the top 40 album, 'Take Me To God', and 'Heaven and Earth, both for Island Records, Wardle fled record company constraints and returned to a more experimental and non-commercial sounding records. In 1997 he started up his own independent record label, '30 Hertz Records', and released a series of critically acclaimed records. Having overcome his alcohol problem in the mid-eighties, Wardle is now a reformed character. His wild man days are now long behind him, and he is now a dedicated family man with a documented interest in spirituality, and in 2000 received a B.A in Music and Philosophy. Until 2009 he wrote regular book reviews for the Independent on Sunday. Since then he has written book reviews for The Times newspaper. In 2008, accompanied by his wife Zi Lan Liao, he toured with a large group of Chinese performers ('mask changers' and dancers as well as musicians). He also released an album that documented that period called 'Chinese Dub' which won the Songlines magazine world Music award. Also in 2008 he made a very well received radio documentary about his old friend Sid Vicious for BBC Radio 3. In 2009 Serpents Tail published his acclaimed autobiography 'Memoirs of a Geezer'. Since that time Wardle has made a 'Japanese Dub' album and a 'Jah Wobble and the Modern Jazz Ensemble album. He has toured with both groups as well. In 2001 he performed at the Glastonbury festival. He has various projects in the pipeline including a record for Cherry Red with new group he has formed with Julie Campbell (AKA LoneLady). This group is called 'Psychic Life' and their eponymous album will be released in November 2011.